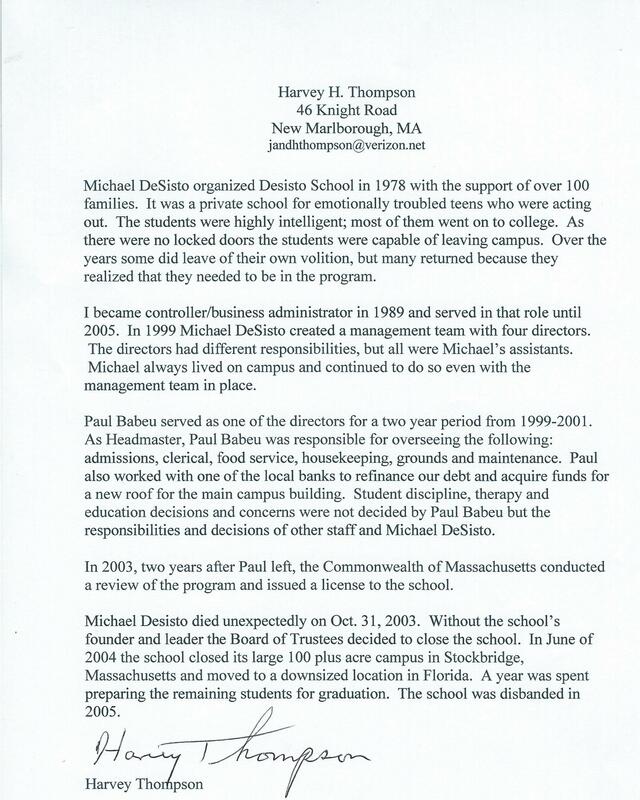 Included in these files are the ACTUAL 1600+ pages of the official file of the case of the DeSisto school as kept by the Superior Court of Suffolk Co., Massachusetts. This is the full public record as it appears in the archives of the Court. As opposed to the substandard ‘drive by’ reporting that has lead to the creation of this false story, we’ve made great effort to bring the entire record here for your review. You deserve to know the truth. Never during my near two year tenure as business Manager for the DeSisto School, did I ever have any knowledge that any students were abused in any way. At no time during a long state investigation were any accusations ever placed against me. I never had any involvement in student discipline. Moreover, had I had any knowledge that such an act was occurring, I would have reported any such person to the proper authorities immediately. My name came up exactly three times in this entire file. Once, in the deposition of Harvey Thompson – the school’s comptroller – in response to a question asking whether or not I had authority to drive a school car. The second and third times my name is mentioned are in the CC section of correspondence from the school’s lawyer to other parties. That is all. Despite how some would have you believe that I was some focus of an investigation, the fact is that you cannot have an investigation of a person without the very mention of their name. And I am not even mentioned in nearly 1700 pages with the exception of passing reference. (c) Affidavit of state’s attorney (Now Congresswoman) Katherine Clark who investigated the DeSisto case and who appeared on ABC15 locally to continue the smears against my character. On TV she stated that I personally stonewalled her investigation. That’s hard to do when I wasn’t there. Its harder to do when she claims in the affidavit at that time that someone else was doing the stonewalling. (d) Letter to the Massachusetts Bar Board of Overseers filing a bar complaint and requesting an ethics investigation into the statements of Congresswoman Clark that are false. This assault on my character is the worst kind of sleazy attack and exactly why people are disgusted with politics. Instead of taking about the issues like jobs and energy, coal and our forests, my opponent Tom O’Halleran fails to condemn these dirty tactics put forth by his friends like Nancy Pelosi. He should be ashamed and embarrassed. Just like all the other allegations against me by the democrats in this election, in no way did I ever use a public position or resources to intimidate a former partner as has been claimed. I’ve spent my life as a soldier and lawman fighting to protect others, not harm them. This issue is yet another example of a dirty, politically motivated attack that has no basis in reality. Read here the state attorney general’s conclusions exonerating me in this matter. My political opponents have taken advantage of my sister Lucy in trying to create some form of controversy for me. First, I love ALL ten of my brothers and sisters, regardless of troubles or issues. Yet, growing up with a sibling that endures the complex interface of drug addiction and mental health issues can be devastating. Many of the mentally ill try illicit drugs as self-medication and thus addiction becomes just another problem to face. My personal experience is what motivates me to stand so strongly against drugs and the cartels that profit from poisoning children. My sister faces many issues as documented below. Her comments, fueled by people who would rather tear me down than build our country up, are disgusting and unworthy of the voters in our district. Those who seek to exploit her should be ashamed of themselves.